There are a lot of interesting folk customs still alive all over Hungary. The two, most known customs of Easter are the "sprinkling" and the egg-painting. Both are very common in both urban and rural areas, among people of every age-group. 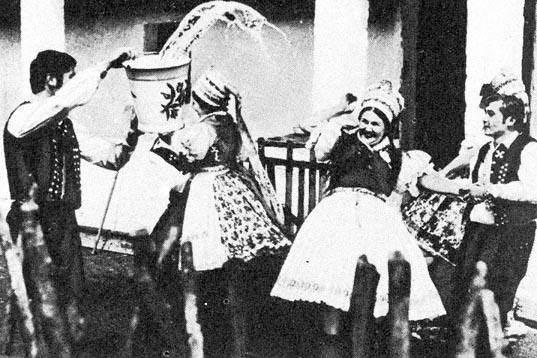 A couple of decades ago men poured water on women in rural areas and women wore folk costumes. Boys often dragged girls to the well and poured water on them with pail. Sometimes they washed them in creek. The possible reason for this very old tradition is that people believed in the cleaning, healing and fertility effect of water. Easter is a 2-day holiday in Hungary. On Monday boys and men visit all of their women relatives, friends, neighbors. Boys in small groups, fathers with their sons, or single men leave early in the morning and their "tour" last all day long. They greet girls and women with shorter - longer poems (mostly with a funny poem about "Easter sprinkling") and sprinkle them with cologne. Women must be well-prepared, they treat men with dessert and beverages - and with hand-painted eggs. Women usually prepare in the previous days by decorating, cooking and painting a couple dozen eggs. There are many different painting method alive. The simplest way is to cook the egg envelopped into a dented leaf, in painting water. The covered part of the egg remains white and will show the pattern of the leaf. Painting liquid can be made from onion skin, wild pear, green walnut or other vegetables yielding different natural colors. Sometimes women "write the egg". They draw folk patterns on the egg by melted wax and put the eggs into painting after this. The egg remains white below the wax and will show the pattern. But the most beautiful eggs are painted by hand with different colors following traditional folk patterns.